See more objects with the tag women's clothing, black and white, ritual, funerals, tortoise, initiation, patronage, African, Igbo. See more objects with the color darkslategrey darkgrey lightgrey dimgrey dimgrey or see all the colors for this object. This is a Woman's wrapper. It is dated early to mid-20th century and we acquired it in 1969. 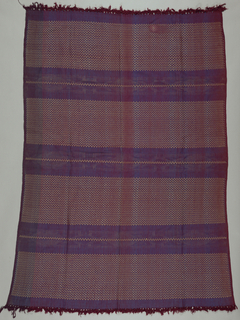 Its medium is cotton and its technique is hand-loomed basket weave of 2 warps x 3 wefts, patterned by supplementary weft floats bound down every 6th warp, some use of non-horizontal wefts. It is a part of the Textiles department. 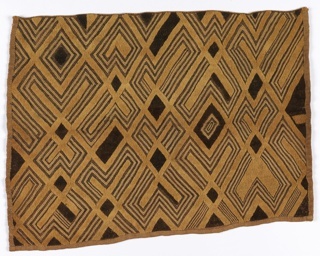 Akwete cloths are woven by Igbo women, primarily on commission from Rivers patrons in the Eastern Niger Delta, who use them for both special-occasion wear and ceremonial purposes, including girls’ coming-of-age rituals and funerary displays. 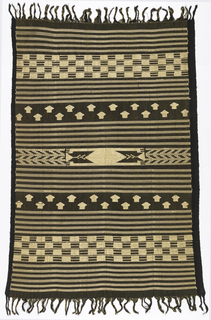 The ritualized use of textiles acquired through trade may impact the nature of the designs, but Akwete weavers prize innovation, and over one hundred unique motifs have been identified. 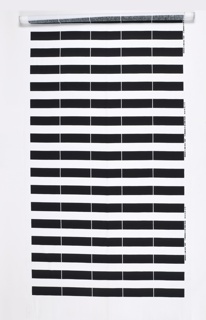 This dramatic black-and-white piece uses bands of a single motif, a variation on the ikaki, or tortoise pattern. Ikaki is, in fact, not an Igbo word but a Rivers term, reflecting the importance of the client/designer relationship in Akwete design. 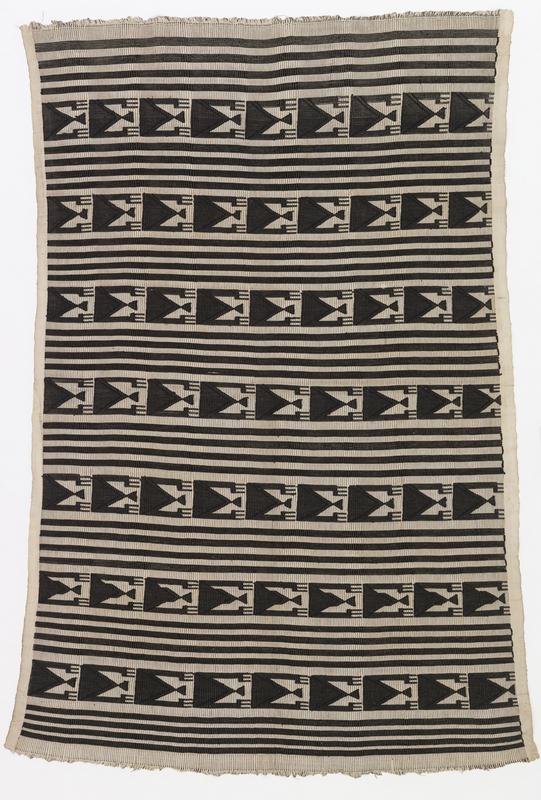 Lisa Aronson, “Patronage and Akwete Weaving,” African Arts 13, no. 3 (May 1980): 63. This object was donated by Mrs. Calvin W. Stillman and catalogued by Milton Sonday. It is credited Gift of Mrs Calvin W. Stillman. cotton, silk or rayon (? ).